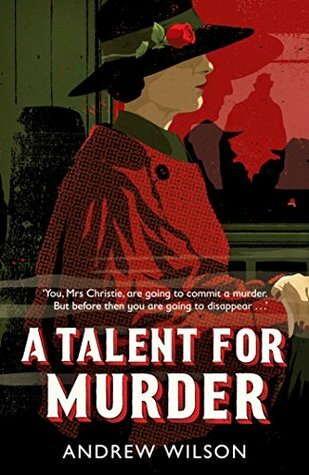 Agatha Christie is heading home from London, consumed by the knowledge that her husband is having an affair. When a man pulls her out of the way of a train, she quickly discovers that he wasn't saving her. Instead, he threatens her life and that of her daughter before informing the acclaimed mystery writer that he wants her to commit a murder for him. While Christie can craft the twists of a novel, she has no intention of actually killing a person. She will need all of her strength and smarts to outwit a man bent on murder. Agatha Christie really did disappear for 10 days in 1926 and to this day, no one is sure where she went or what happened to her. Andrew Wilson has taken the few details we do know about that period in Christie's life and imagined what might have occurred. While the story itself is compelling, the big reveal at the end is nowhere near as surprising as the ones in Murder on the Orient Express or Death on the Nile. It's interesting and difficult to write about a person who actually existed, even if you are putting them in imaginary circumstances. But I couldn't imagine that the woman who wrote such delicious twists and such crazy characters would have been the way Wilson portrayed her. She is obviously a woman in crisis, but she comes off as a rather boring individual. It almost seems as if the author was so concerned with not creating an upsetting portrayal of a real woman that he forgot to really develop the character that lives on his pages. It's always fascinating to debate what happened in history, since we will likely never know the truth. I'm glad Andrew Wilson imagined what might have happened to our beloved Agatha Christie, but I wish he had brought her to life more vividly. It doesn't sound like the implementation of this plot was the most exciting, but I love the idea. I'm not interested in reading the new Poirot novels, since I don't think they'd live up to Christie's, but I would definitely enjoy reading about her. It's Monday and summer is wrapping up! It's Monday and life is moving right along! It's Monday and I'm back from Disney!